CatchJS automatically collects all uncaught exceptions from your users' browsers, and presents a detailed log of their circumstances. This includes the browser type, the stack trace, and even screenshots and the click trail which lead to the error. Create delightfully fast websites. Don't let error tracking slow things down. 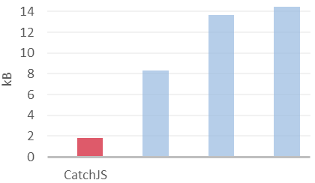 The CatchJS library is up to 8 times smaller than our competitors, only 1.76kB gzipped. 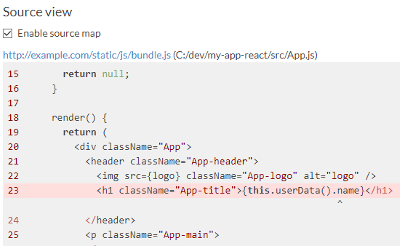 Get the full error context, and see exactly what went wrong. Source maps will be collected and applied automatically, with no action needed from you. Track and log whatever data you'd like, using the catchjs.log() function. It is like the developer console, but logging remotely from your users' device. In addition to error reporting, you get a dead simple way to monitor any event of interest. Get alerts when new errors happen, along with weekly summaries. See what clicks lead to the error state. There are no hidden costs and no surprises, just a flat monthly rate. With an average hourly cost for a software engineer at 120$, CatchJS Production only needs to save one developer 45 minutes before it has paid for itself. Thanks to the click trail and screenshot features, the usual story is that CatchJS avoids days or weeks of frustrating debugging. Are you part of an open source software project? We have much gratitude to the open source software community, and therefore provide a free subscription to such projects. Click here to apply.